Pitney Bowes Franking Machine are the gold-standard, they are the largest supplier and manufacturer of franking machines in the world. In 1902 Arthur Pitney created his first postage-stamping machine and began the Pitney Postal Machine Company. A little bit later in 1908, Walter Bowes set up the United States Postal Service offering stamp-cancelling machines. You can see where this is going, right? In 1920 Arthur Pitney and Walter Bowes decided to merge the two postage companies to form the Pitney Bowes Postage Meter Company with the hope of producing a machine that would combine both of their systems. They have now been creating innovative products for over 90 years. Pitney Bowes is now a huge, international company that provides global eCommerce solutions, shipping and mailing products, customer information management solutions, location intelligence and customer engagement. They are very well known and have a reputation for increasing productivity in their customers. With ability to process up to 20 letters a minute and 30 prints a day, the DM50 has been designed for low volumes of postage. It is an ideal entry-level machine with some great features to enhance your franking experience and postage potential. The compact, convenient and easy to use machine comes with a 2.5kg built in scale for accurate costings without going to the post office or paying more than necessary. Access to all postage rates including UK and Overseas. Use all of Royal Mail’s service that are liable to VAT, any changes made to the postage rates by Royal Mail will be automatically downloaded at the press of a button. Uses the IntelliLink postage meter system, allowing you to download information, services and updates directly into your machine. Personalizes mail by having up to five messages prepared for your envelopes. Uses smart blue ink rather than the traditional red. To buy the DM50 outright will cost around £1,000, but you can rent the machine for about £19 a month or lease for approximately £8 a week. Pitney Bowes also offer a 30 day free trial for if you’re unsure and want to give it a go before committing. Overall this is a great model for smaller volumes of mail, even though it’s small it still comes with many brilliant features and can efficiently handle a variety of postage needs. It will save you money and time without burning a hole in your businesses pocket. This franking machine has the ability to process mail at a rate of 65 pieces a minute, it is simple to use, compact and efficient. The DM300 is semi-automatic and has an envelope sealer making mail processing even easier and less time consuming for employees. This medium volume machine comes with Pitney Bowes IntelliLink technology making online services easy to access and take advantage of. To buy the DM300 would cost around £3,500 and to rent will cost around £50-£100 a month. The DM300 is a quiet, compact model that has many great features designed to make mail processing a quick, easy job. The semi-automatic machine can process around 75 letters a day and has the capabilities of many larger machines. The Pitney Bowes DM450c is a high volume franking machine that can handle 120 letters per minute. This machine has been designed to automatically feed, frank and stamp mail as well as the option of sealing envelopes too. These automatic features significantly reduce mail preparation time as well as saving money by ensuring each piece of mail is accurately priced. Special delivery options including next day, fully insured and special delivery by 9am. To buy the DM450c outright would cost around £5,000 but it can be leased for £200 a month. This high volume machine makes postage easy for businesses who send out large amounts of mail. It is fully automatic and will warn you when: postage funds, ink or water levels are low. The machine has a password for security and also has value protection options. Overall this machine comes with a lot of fantastic features to benefit you and your business. These franking machines have all been manufactured by Pitney Bowes, they are high quality and highly recommended machines for smaller businesses. Each one offers something slightly different and you should be able to find one that is more suited to the needs of your business. Consider how much mail you send and then look at the other features and consider whether or not they would be of use to you. The Pitney Bowes DM100i is a small and convenient franking machine, it can fit nicely on any desk and processes mail very quietly to avoid disruption in even the smallest offices. This low volume franking machine is easy to use and will increase productivity. The DM100i has a heavy duty scale that can weigh parcels of up to 35kg – by weighing mail you ensure you get an accurate postage cost preventing you from overpaying for what you are sending. It also has differential weighing (something you don’t often get on smaller franking machines) that means you don’t have to pre-sort the mail as the DM100i will apply the correct rate for the mail as it is removed from the scale. Intellilink postage meter system – this system allows you to easily access online services, download information and updates onto your machine. Automatic date and manual date advance options. Franks at a speed of 30 letters a minute. The DM100i is a compact, non-disruptive and effective franking machine, it saves you time and is simple to operate with clearly labelled keys and straightforward functions. All of your mail can be branded with a promotional message to help generate more business and opportunities. You will also get warning alerts if your postage or ink levels are low making sure you are not caught short at any time. The DM110i has perfect capabilities to suit a small business, the entry level franking machine is able to process 25 letters a minute. You can preset your most used jobs to making processing your mail even simpler and time efficient. Your business will save money by paying less than the price of stamps to frank your post and you won’t be overpaying “just in case” anymore as the exact postage will be calculated for every piece of mail thanks to the built in weighing scale.It will even help keep your energy bills down thanks to it’s automatic sleep mode after being inactive for a certain period of time – all of these features are designed to help your business save time and money when it comes to your post. The DM110i is a semi-automatic, simple and easy to operate machine, it comes with great features that will benefit a small business to get the most out of the mail. When using a franking machine you have a more professional looking envelope mark, more control and management over your costs and you will save money with the discounted rates and accurate costing calculations. The DM150i is a slightly faster entry level franking machine, it is able to frank 40 letters per minute using a semi-automatic feeder. This reliable machine has an integrated 2.5kg scale and is compact and quiet enough to be used in any office environment. To help save you time and avoid postage errors the DM150i has an automatic date advance feature, another great time saving feature is the ability to pre-set frequently used settings so they can be accessed at the touch of a button. The DM150i has many great features that will benefit small businesses, it is an easy to use machine making it perfect for first time users and is very reliable. The DM150i is reasonably priced and very highly recommended for small businesses. 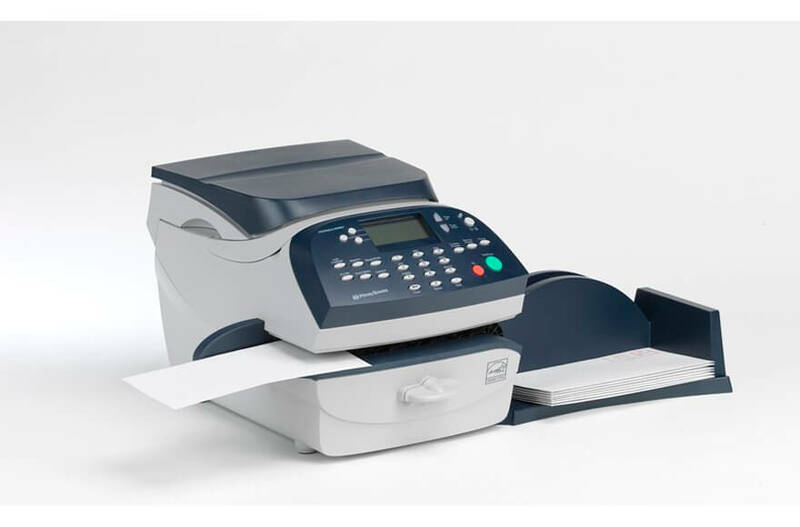 The DM200i is an affordable and high quality franking machine, it can frank mail at a speed for 40 letters per minute and is easy to operate. The control panel is clear for ease of use and step-by-step instructions are accessible for any first time users, luckily the DM200i can do a lot of the jobs automatically so it is easy even if you have never used a franking machine before. You don’t have to sort the mail before it is franked as the DM200i can process mixed mail, this franking machine will also alert you when water is running low and needs to be refilled – this prevention the machine overheating and keeps the mail being franked efficiently. The DM200i has a slightly faster speed and a few more features than the previously mentioned models. You are able to print a return address onto outgoing mail if necessary, download logos to strengthen your brand and even remotely access the machine via a USB PC connection or analogue phone line. The DM200i comes with up to date technology that allows you to easily access reports, refill postage with just one touch and save money on every item mailed. Pitney Bowes is the leading supplier and you can see why. They have a lot of experience, create a range of products to suit a variety of needs and offer many great features on the franking machines they sell. By choosing to use a franking machine to send your mail you will access franking discounts and your business will save time and money, just make sure you choose the right franking machine for your needs! The franking machines they have available are easy to use, professional and will save you money on postage. However it is worth remembering the additional costs such as ink and labels.